Trade The Stuff You Don't Want...For The Stuff You Do. There really is something to be said for looking for ways to avoid throwing things into a landfill. Those of you who know me already know I am a big environmentalist, so the idea of swapping with others instead of trashing really appeals to me! Luckily for all of us looking to swap our belongings out for other items, there are a few websites around to help. Swaptree.com is a place where you can swap books, music, movies, and video games. All you have to do is list the stuff you have to swap and list the stuff you want, and make trades through the mail. These guys even figure out the postage and let you print postage from home, saving you a trip to the post office. 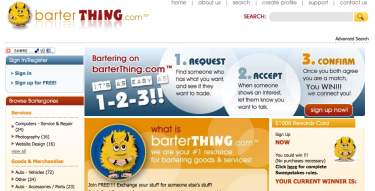 Barterthing.com A little different than swapping, these guys help you get started in the world of bartering. Trade a timeshare for lawn care service or haircuts for plumbing. Everybody has something that someone else wants, so why not look for it online before you pay for it elsewhere? 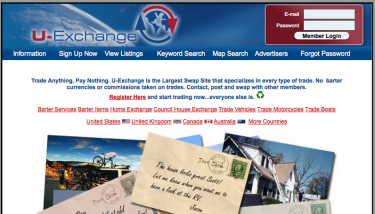 U-exchange.com combines bartering and swapping in one site. There are no barter currencies or commissions taken on trades, and you can even trade stuff like cars, boats, and homes. If you don’t feel like trying to sell whatever you have, try to swap it for something else before you throw it in the trash. You never know what someone else may be looking for, and you might just find something you want that someone else has no interest in. It’s frugal and green all at once – 2 of my favorite things! I am in the process of swapping books right now with a friend. Makes so much sense to do it. I’m presently overloaded with stuff to put up on eBay and Craigslist. I like the swapping approach better, but wonder if it doesn’t conflict with my goal of simplifying my “piles-of-crap-I-don’t-need” lifestyle. Perhaps after I’ve thinned out the collection a bit with eBay-ing, I’ll look into it. I agree: much better than just eating up landfill space. Don’t forget to mention Freecycle (http://www.freecycle.org/). No trading needed, just give up what you don’t need and find things you can use for free. Best I can tell you on this is that you would be absolutely shocked at some of the stuff that other people want. I have recently found out that my elderly mother is leaving the house and property to my single brother who has lived with her all of his life. My part that is stated in the will is that when he decides to sell the house I get 1/2 of the junk and I mean junk that is in the house. There are some good pieces…sterling, 2 antique bedroom sets, china and some brick a brack. I really do not want this stuff. I have told my brother…just keep it all. He says no, mother wants you to have a share of her stuff. A lot of this junk is broken.